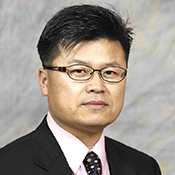 Deukhyoun Heo (S’97–M’00, IEEE) received the B.S.E.E. degree in electrical engineering from Kyoungpuk National University, Daegu, Korea, in 1989, the M.S.E.E. degree in electrical engineering from the Pohang University of Science and Technology (POSTECH), Pohang, Korea, in 1997, and the Ph.D. degree in electrical and computer engineering from the Georgia Institute of Technology, Atlanta, in 2000. In 2000, he joined the National Semiconductor Corporation, where he was a Senior Design Engineer involved in the development of silicon RFICs for cellular applications. Since Fall 2003, he has been Professor with the Electrical Engineering and Computer Science Department, Washington State University, Pullman. He has authored or coauthored approximately 105 publications, including 46 peer-reviewed journal papers and 59 international conference papers. He has primarily been interested in RF/microwave/opto transceiver design based on CMOS, SiGe BiCMOS, and GaAs technologies for wireless and wireline data communications, batteryless wireless sensors and intelligent power management system for sustainable energy sources, adaptive beam formers for phased-array communications, low-power high data-rate wireless links for biomedical applications, and multilayer module development for system-in-package solution. Dr. Heo has been a member of the Technical Program Committee of the IEEE Microwave Theory and Techniques Society (IEEE MTT-S) International Microwave Symposium (IMS) and the International Symposium of Circuit and Systems (ISCAS). He has served as an associate editor for the IEEE TRANSACTIONS ON CIRCUITS AND SYSTEMS —PART II: EXPRESS BRIEFS (2007–2009) and has served as an associate editor for the IEEE TRANSACTIONS ON MICROWAVE THEORY AND TECHNIQUES. He was the recipient of the 2000 Best Student Paper Award presented at the IEEE MTT-S IMS and the 2009 National Science Foundation (NSF) CAREER Award. Heo has primarily been interested in RF/microwave/opto transceiver design based on CMOS, SiGe BiCMOS, and GaAs technologies for wireless and wireline data communications, batteryless wireless sensors and intelligent power management system for sustainable energy sources, adaptive beam formers for phased-array communications, low-power high data-rate wireless links for biomedical applications, and multilayer module development for system-in-package solution.